In an earlier post in this series I passed comment on the program ‘REplay PLAYer’, mentioning its creator, Karlheinz Essl, and describing it as ‘ a multi-featured program for manipulating a single sound sample’. I was talking in that post about programs suitable for manipulating a group of four short samples, so I didn’t go into ‘REplay PLAYer’ in more detail. However, I thought it would be worth adding a post on programs for manipulating a single longer sample. ‘REplay PLAYer’ is my favourite of these – it costs a bit to buy it, but I’ve found it very useful in the past, and it has a couple of features which make it particularly versatile in use. 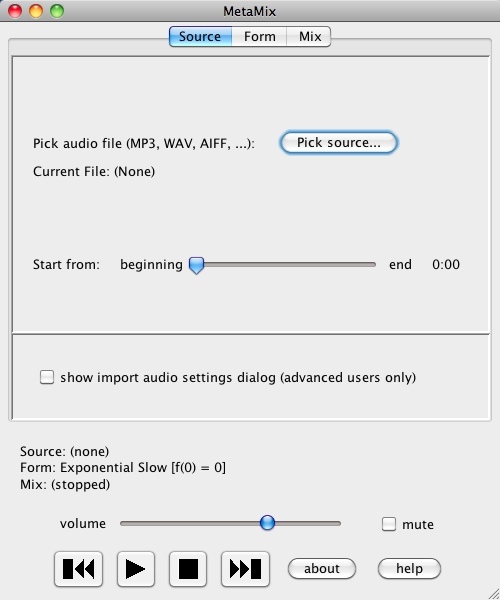 First of all, the sound file of your choice can be imported into the program, via the ‘Shredder’ menu, and settings can be adjusted affecting changes to the samples’ volume, pitch, EQ, panning and stereo spread which are automatically made, tailoring the way in which the file is ‘shredded’. Better still, three of your favourite VST or Audio Unit plug-ins can be imported and used alongside the built-in effects – the picture shows two that I often use, brainworx bs_solo (Stereo imaging) and GSi TimeVerb (Reverb). In this way you can allow your sample to run while small or large changes are made to it. At any time you can change, for example, the range of pitch, volume or panning variations, turn them off or set them to move randomly from one value to another. 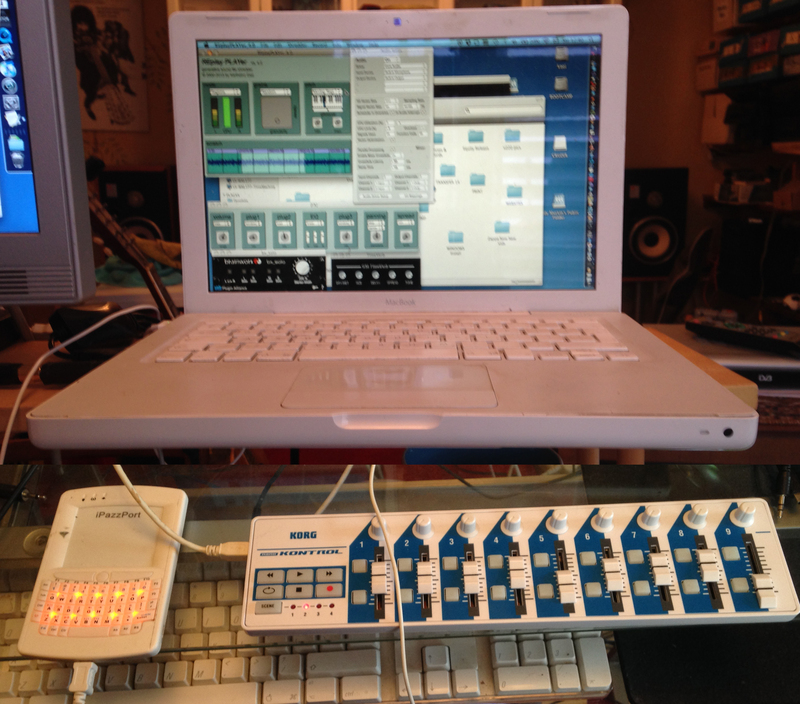 In addition to this, what makes ‘REplay PLAYer’ – as described – a ‘computer based instrument for live performances’ is the ability to control a number of the parameters in real time via MIDI. As the Menu suggests, ‘REplay PLAYer’ will also record the results of its work to a file (aiff, ulaw, wav or raw data) on your hard drive. It’s important to note that the program is set to start or stop working in the ‘Shredder’ menu, and recording is set to start or stop separately in the ‘Record’ menu; audio is turned on or off in the ‘Audio Status’ window. Another program I’ve used on occasions for manipulation of a single file is ‘Metamix’. 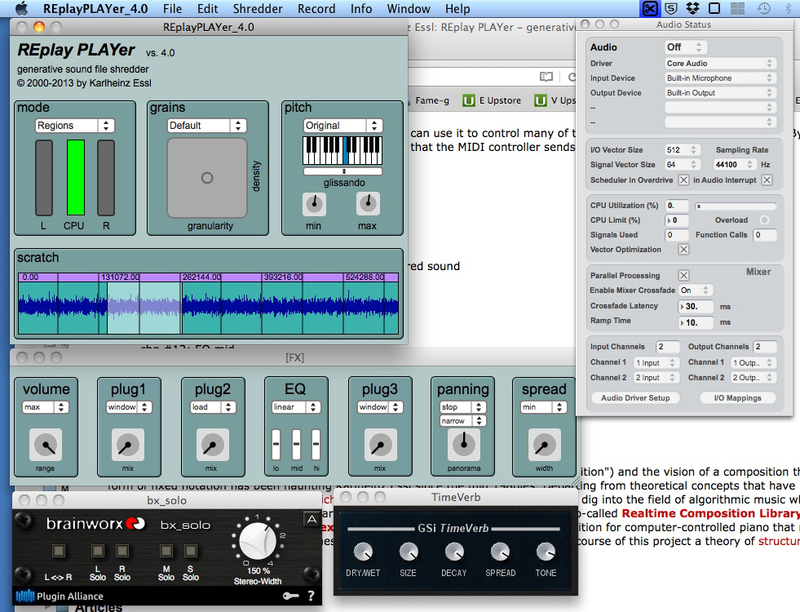 This program gives the user less control than ‘REplay PLAYer’ – a deliberate choice on the part of the designer, Jason Freeman – but works well with some sound files. 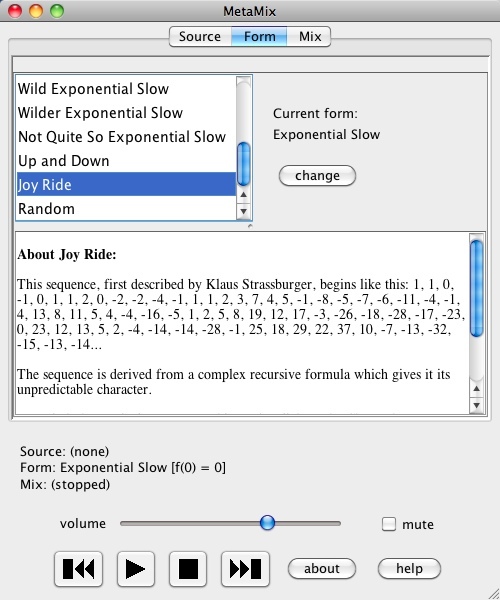 These three screenshots of ‘Metamix’s control windows shows the elements you can choose – the twelve number sequences are given names, as can be seen, such as ‘Wide Exponential Slow’, ‘Up and Down’ and (my favourite) ‘Joy Ride’. 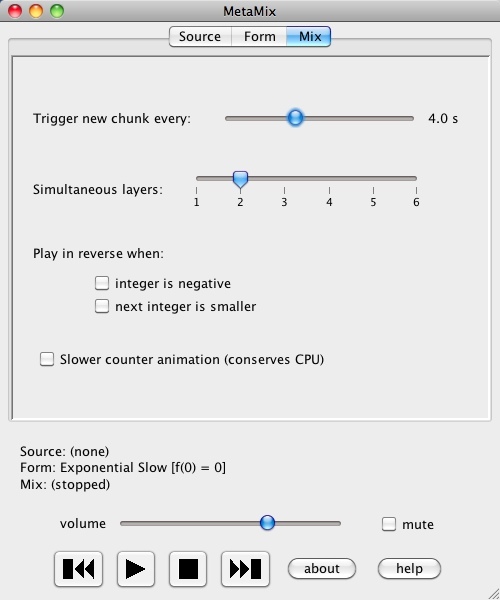 As the document above explains, ‘To remix the audio track based on an integer sequence, the software first marks the audio track at equal-length time intervals and labels those markers with the natural numbers. Each time it obtains the next number in the integer sequence, it begins audio playback at the correspondingly-numbered marker. In other words, ‘Metamix’ can create quite a dense sound, with short, overlapping sequences, or a more spacious sound with longer extracts from the original source file. I haven’t yet attempted to produce a Pure Data patch which will work on a single file in these ways. If I do, you can be sure I’ll be writing about it here!